In large bowl, stir Bisquick mix and hot water with fork until soft dough forms; beat vigorously 20 strokes. Divide dough in half. Press half of the dough in pizza pan, using fingers dipped in Bisquick mix; pinch edge to form 1/2-inch rim. Spread pizza sauce over dough. In medium bowl, mix cheese and pizza seasoning; sprinkle over pizza sauce. If you prefer, or if you can't find the Mexican cheese blend, make your own blend. Mix 1/2 cup each shredded mozzarella, shredded provolone, shredded Cheddar and grated Parmesan cheeses. 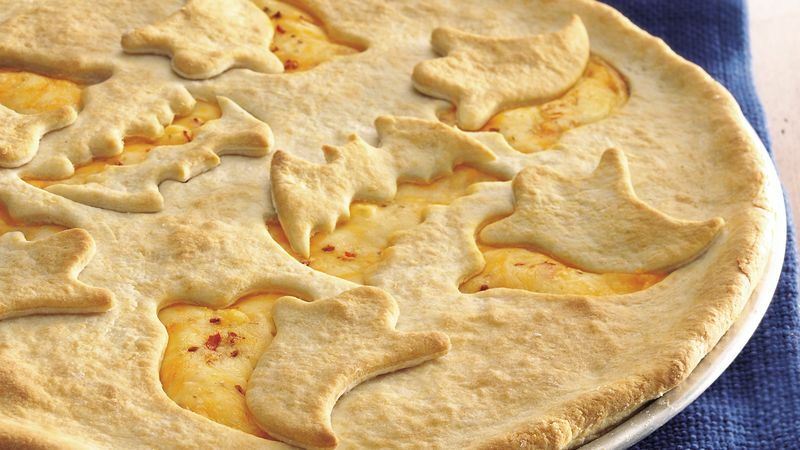 Smaller Halloween cutouts will allow you to have a few more designs and make it easier to transfer the cutouts to the pizza.